The Victorian angler diary program has been operating in Lake Tyers since 1999/00 and is currently funded by the Recreational Fishing Grants Program. Volunteer anglers have been contributing detailed information about their fishing trips including their time spent fishing, fishing location, species targeted and caught, fish lengths, number of rods and baits and hook type/sizes used. Profile of the fishery. Angler diarists give an insight into the species targeted and caught in Lake Tyers as well as Information on which fish are kept and released. Local knowledge. Anglers provide their opinions on the status of key fish stocks and comment on trends in fish abundance over the past 5 years. Volunteer anglers contribute to the angler diary program as either a 'research' angler or a 'general' angler. General anglers record information from their normal fishing trips. 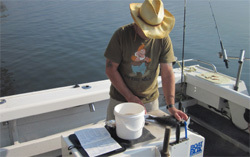 Research anglers target key species and if necessary alter their fishing techniques to catch the largest possible size range of the targeted species, including undersize fish. Angler diarists recorded 120 trips for black bream and 55 trips for dusky flathead in Lake Tyers during 2010/11. 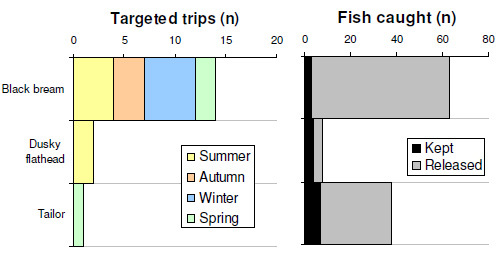 The catch rates (fish per angler hour) of black bream were lower than in the previous year (2009/10) but similar to the average over the past five years. Catch rates of dusky flathead were higher in 2010/11 than the previous year and similar to the 5 and 10 year average. Catch rates of black bream and dusky flathead by diary anglers in Lake Tyers. 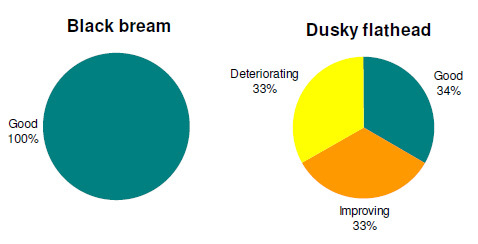 Data collected by angler diarists in Lake Tyers suggests that while the populations of black bream and dusky flathead are variable from year to year, they are resilient, in a healthy condition, and showing no evidence of a persistent decline in abundance. Nearly a quarter of bream caught were below the legal size (23%). These bream are expected to recruit to the fishery over the next few years. Were mostly below 50 cm TL (90%). There is concern over the decline in large dusky flathead (>50 cm TL) in recent years, suggesting the population should be closely monitored in the future. Species targeted and caught by general angler diarists. Dusky flathead were targeted during summer while bream were targeted throughout the year. Tailor were also targeted during spring, most were released. lack bream stocks are in good condition. There was a mixed response to the status of dusky flathead stocks in Lake Tyers; some anglers believe stocks are in good condition, others feel it is improving and some think the stocks are deteriorating. 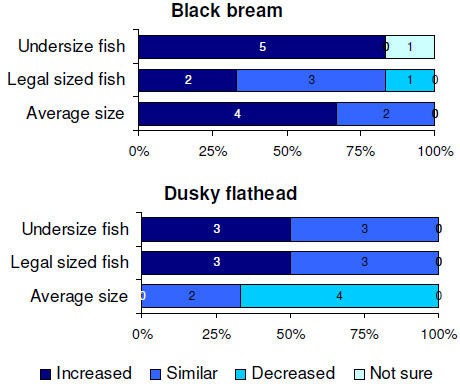 Angler perceptions of black bream and dusky flathead populations in Lake Tyers in the past 12 months compared to the previous 3–4 years. Angler perceptions of the status of black bream and dusky flathead stocks in Lake Tyers.